What makes a Naturopathic Doctor? Naturopathic Doctors (NDs) are highly trained primary-care practitioners who have completed four years of post-graduate training at a college accredited by the Council of Naturopathic Medical Education (CNME). NDs must also have completed the standardized Naturopathic Physicians Licensing Examination (NPLEx) set forth by the North American Board of Naturopathic Examiners (NABNE), and should hold an active license or registration in their state or province of practice. In Ontario, NDs are licensed by the College of Naturopaths of Ontario under the Regulated Health Professionals Act. NDs are set apart from conventional primary-care practitioners by taking the time to understand who you are. We encourage you bring lists of your concerns to your appointments (at least I do) so that you don't forget any little detail that's been bothering you. We blend modern diagnostics with traditional therapies. We aim to work with your medical team as we all have our strengths. If we don't end up working together, but you're still looking for an ND, don't be shy to ask about their qualifications. Unfortunately, there are quite a few people out there who may use a variation of the protected titles "Naturopathic Doctor" or "Doctor of Naturopathic Medicine". A Doctor of Natural Medicine, for example, is NOT a licensed Naturopathic Doctor. Ask if they're licensed and where they went to school. If you're still in doubt, they will be listed on the CONO website if they are practicing in Ontario. For Naturopathic Doctors, completing a Residency is optional and opportunities are rare. All NDs complete a one-year Internship during their training, however a Residency is different. Additional time is spent learning by researching, being mentored by experienced NDs, and teaching future NDs. Clinical exposure is exponentially broadened and specialties are learned. I completed my 2-year Clinical Residency at CCNM in 2012. During this time, I mastered by teaching primary care, physical exams, orthopedics, gynecological exams, botanical medicine, injections and venipuncture, and health psychology to ND students (I continue to teach orthopedics). I supervised 4th-year interns during their time in the teaching clinic, at sporting events, and in various community satellite clinics including Sherbourne Health Centre and Anishnawbe Health Toronto. I completed research looking at the impact of global health experience on the confidence and education of naturopathic students which was presented at the American Association of Naturopathic Physicians (AANP) conference in 2012. Overall, I learned a lot. Facial Rejuvenation Acupuncture - Certification completed March 2011 via Virginia Doran, M.Ac, L.Ac. of Luminous Beauty. FirstLine Therapy Healthcare Provider - Certification completed July 2012 via Metagenics FirstLine Therapy Program. 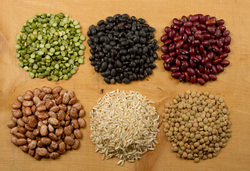 ​Beans and grains photo (c) Jen Hulls.